with such a huge selection of local restaurants, being a vegan in los angeles is easy…but it sure isn’t cheap. most meals cost anywhere between 9-14 bucks, and if you are one to grab lunch from a restaurant during the workweek, this can add up really fast. 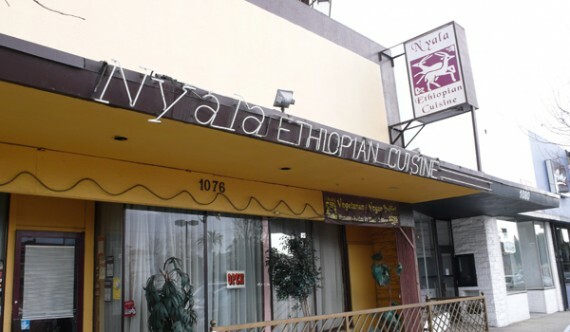 luckily there is at least one place in this town where herbivores can get stuffed at lunch time without too much wallet damage—nyala ethioipian on fairfax has an all-you-can-eat vegan lunch special from 11:30am-3:30pm on weekdays for just $6.95. that’s right, for under 7 bucks you can eat all the ethiopian food you want, and it’s all animal-free. if i worked anywhere near this place, i’d probably be there every day. 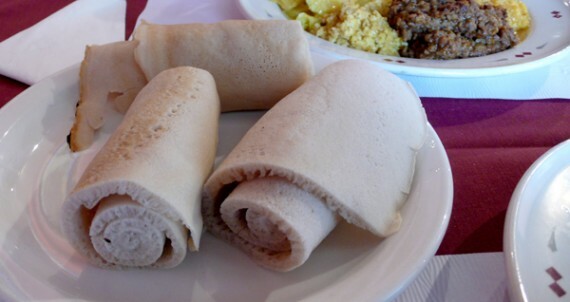 you may remember that i’ve written about ethiopian food before on this blog and described how most meals consist of several thick, spicy stews called wots and that are served on top of a large piece spongey sourdough bread called injera, with more rolls served on the side. traditionally you use the bread to scoop of bits of the wot and eat it, without any utensils. for the vegan buffet, nyala’s doesn’t serve the stew on injera (i guess that wouldn’t be practical for getting seconds), but they do offer plenty of bread on the side. 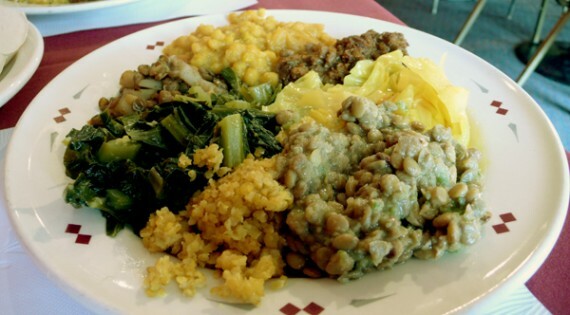 i got my fill of spicy stews consisting of lentils, potatoes, assorted vegetables and greens. it was all absolutely delicious and i took extreme comfort in the fact that every single thing offered at the buffet was vegan. the bread worked well on the side, and was perfect for scooping up the thick wot. with so many different flavors of stew and the option to go back and get as much as you like, i can’t see how they keep this buffet under $7! seriously, it’s the best vegan lunch deal in this town that i’ve ever come across. the atmosphere is also quite lovely at nyala. the place is large and spacious, and has big windows that the sun shines through during the day. 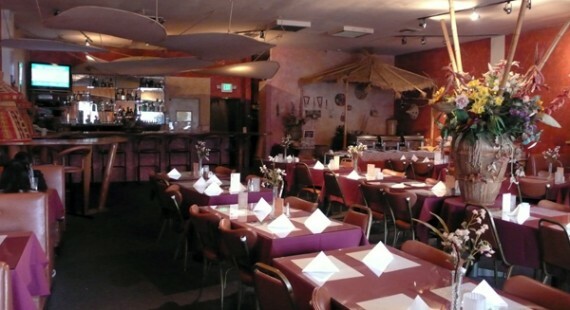 the booths are comfy and there’s a mix of modern and traditional ethiopian decor. so for a delicious and cheap vegan lunch that will stuff you to the gills, hit up nyala on fairfax for their weekday special. all those who work in the area, consider yourselves very lucky. i am just waiting for the next federal holiday so i can eat nyala’s lunch special again–president’s day this week was my first opportunity!